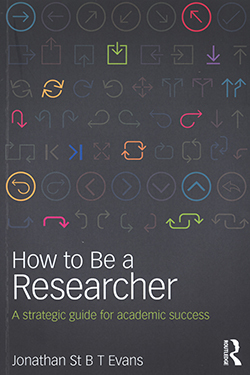 Senior lecturer of nursing Nirmala Arunasalam reviews How to be a researcher: A strategic guide for academic success (second edition). Realistic advice and strategies are provided in this reader-friendly book. It sets out what students and scholars in psychology must do, why and how to do it to become academic researchers. This book is well structured, consisting of nine chapters and is divided into two parts. Part one offers good hints and tips as a starting point for the reader to question their interest and commitment in pursuing academic research. Comprising of seven chapters, the author uses reflective accounts to encourage informed decisions and skills development. A clear and succinct ‘key points’ table at the end of each chapter allows reflection of learning. For many nurse researchers, so much of the advice in part one will be familiar; such as the challenges of writing for publication. Meanwhile, part two consists of two chapters and takes readers through key issues to develop their career. The author discusses philosophical and psychological issues, with the focus on deductive and statistical assumptions. Points of significance levels in empirical psychology, such as how to minimise the risk of false inferences, are raised. Simple and clear arguments to enable understanding are provided. A large number of relevant references have been used and these validate academic and research rigour.